Fourth of July weekend is a special time here on B&B--in addition to Independence Day, we also celebrate Blondie’s birthday on the 5th! Having a birthday so close to the 4th of July festivities, Blondie is used to having a little red, white and blue represent on her big day and I wanted to make sure this year was no exception. Over the years I’ve seen a lot of cool flag rectangular flag cakes and I decided for the birthday girl I’d like to get a little playful with the flag cake form. 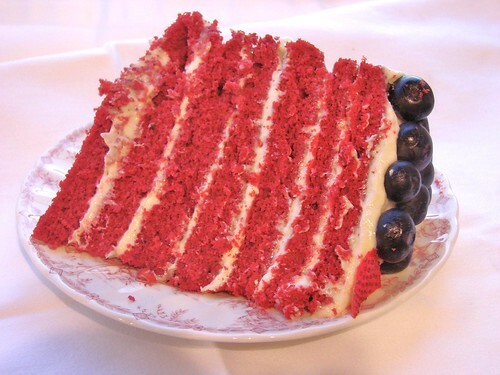 Drawing inspiration from Old Glory, I thought it would be fun to make a round red velvet cake with seven layers for the seven red stripes on our nation’s flag with six “stripes” of white frosting in between. The top of the cake would have a thin schmear of frosting and be covered in blueberries with a bright red strawberry star in the center. The frosting for this cake is terrific. It’s rich and creamy without being overly decadent and sweet without being cloying. The cake itself is light and moist and the fresh berries tie the whole dessert together to give you the taste of summer. Other than the time it takes to bake the seven layers (which if you’re like me and only own 2 eight inch cake pans, can be a small hassle), this cake is fairly easy to make and assemble and it’s a showstopper at any picnic, barbecue or, summer birthday party. Happy Birthday, Blondie! This one’s for you! Preheat the oven to 350 degrees. Grease and flour 8 inch cake pans (ultimately you will be making seven layers so flour as many pans as you have--the more pans you have the quicker the process will go, otherwise you will have to rinse and prepare the pans in between). In a large bowl mix the flour, cocoa, buttermilk powder, baking soda, baking powder, and salt and set mixture aside. In the bowl of a standing mixer, cream together butter and sugar until fluffy. Add in the eggs one at a time, scraping down the sides in between additions. Then add vanilla and mix until completely incorporated. Add 1/3 of the dry mixture to the creamed butter and sugar and mix together on medium until incorporated. Add ½ of the water and mix until incorporated then alternate adding dry mixture and wet mixture until all wet and dry ingredients are incorporated. Add in red food coloring and white vinegar until just incorporated. For each layer pour approximately ¾ cup of batter into your prepared pans and bake on a center rack in the oven for approximately 10 minutes or until a cake tester comes out clean. Cool in the pan for 5 to 10 minutes and then turn out onto a wire rack to cool completely. Add cream cheese to the bowl of a standing mixer and beat on medium until fully softened. Then add the sticks of butter one at a time, beating until fully incorporated and smooth. Beat in powdered sugar until frosting is smooth and creamy then mix in vanilla until fully incorporated. On a large serving platter, place your bottom layer and frost up to the edges. Add the next layer and repeat until you have a fully frosted seven layer cake. Frost the top layer of the cake. Cut the strawberry into 5 equally sized thin side slices of the strawberry to make the red points of the star for the center of the cake with a small side slice to cover the space in the center of the star. 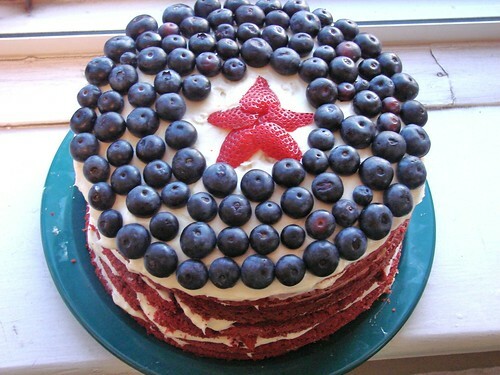 Place the strawberry star in the center of the cake and top with blueberries in a circular pattern, leaving a small circle in the center surrounding the strawberry. Slice, serve and enjoy! You can follow the goings on of our fellow Cake Crew bloggers via twitter. The judges are picking their fav video based on creativity, appearance, and online feedback. So if you like our cake (or heck, if you don't like our cake) leave us a comment to tell us what you think! that's a lotta cake!!! a lotta delicious cake!! Dang! That is a spectacular cake! Good job! Great looking cake, Brownie. Happy late Birthday Blondie! Of course, I think you should win. Beautiful cake. This definitely should win. I love watching the Cake Boss. There was a TLC marathon on his show the other day. Your cake is wonderful. I think the Cake Boss should place the call to Blondie and Brownie!